ANDRIY.CO - Organization of work in a network of editorial TCU Standard and TCU Evolution. Organization of work in a network of editorial TCU Standard and TCU Evolution. immediate reply. This is a very simple process, as well as a system of «goods prices, accounting for ...» was originally built with a view to joint networking multiple users in one database. assumes that you already have multiple computers together within a stable and configured LAN. have a computer that will store the database. Let's call this machine the server database. This may be one of the working machines. It is desirable for these purposes to provide the most powerful computer of the available (though TCU presents fairly modest hardware requirements). ALWAYS a computer must be connected to an uninterruptible power supply . Database file called tcu_be.mdb and the default is in the program directory (typically, c: \ program files \ tcu3 \). Create on the drive c: TCUBase catalog server and move the file there tcu_be.mdb. Give standard Windows share papake TCUBase server. To do this, right-click the folder TCUBase and select «Sharing and Security». Set flags «the Share this folder» and «Allow modification of files on the network». Click on «Apply». - Hit the button "..." (the figure is highlighted in yellow). - in a standard file dialog box via the network environment is the server and select the resource TCUBase. In the open folder and select the file tcu_be.mdb Hit the button «OK». Click on the button «Save connection string». Application will ask for the restart, which you can only agree. When you restart the program to connect to the database, which is located on a server in a directory TCUBase. After these steps for each computer, working. 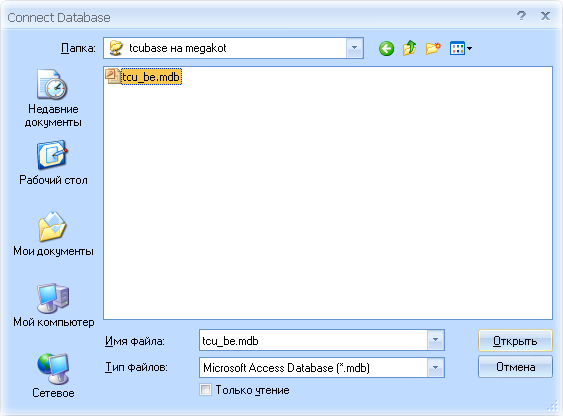 Limit on number of users imposes itself a database Microsoft Access, as a rule, called the figure of 10 users, although no severe restrictions on the number of users will not. Experience shows that when the average load (20-30 papers for each job in the day), the system works without problems and with 20 users. But with so many users have is to think about purchasing TCU version «Network» or «ultra», allowing the database MS SQL Server . This is another level of reliability and speed, especially when large amounts of data.